The Constitution is the ​foundational framework upon which any government is built on. It governs the socio-political, religious and economic life of the people. It is, therefore, a very important instrument that must be given adequate attention with regards to civil awareness. ​​Indeed, Nigeria has a long history of it's constitutional developments, as will be closely examined down this page. These constitutions served as the legal instrument used by the colonial regime ​for the administration of Nigeria. ​The 1914 constitution led to the amalgamation of the Colony and Protectorate of Northern Nigeria with the Colony and Protectorate of Southern Nigeria, under the colony and authority of the British Monarch. Lord Fredrick Lugard, a British-Monarch appointee, became the first Governor-General of the amalgamated Nigeria. Fast forward eight (8) years, the 1914 constitution was succeeded by the 1922 constitution, also called the Sir Clifford Constitution. 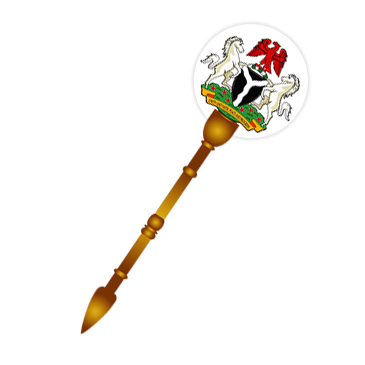 This constitution gave rise to a 46 member Legislative council with extended law-making responsibilities to include the southern provinces, and Lagos. The council ​members comprised ​of both nominated and elected members, including the Governor, Lieutenant-Governors, three representatives for Lagos as the commercial and administrative capital, and one representative for Calabar as a commercial center. The constitution allowed both Lagos & Calabar ​to elect their representatives to the legislative council. Effectively, the 1922 Clifford constitution paved the way for the very first electoral system in Nigeria: three (3) electoral seats for Lagos, and one (1) electoral seat for Calabar. Candidates vying for the legislative council position ​are required to have a minimum annual income ​of 100 pounds. A constitution amendment of the existing 1922 constitution resulted to the 1946 constitution, ​also known as The Richard Constitution, in recognition of then British Governor-General of Nigeria, Sir Arthur Richards. Notably, this constitution gave rise to the first division of Nigeria into Geo-political regions, the three main regions namely: the Northern region, the Western region and the Eastern region. The constitution amendment team comprise of the Governor-General, sixteen (16) official and twenty eight (28) unofficial members. Of the twenty eighty (28) unofficial members, the Governor nominated two (2) members, while four (4) members were elected. The North, West and Eastern Regions nominated eleven (11), eight (8) and six (6) members respectively. The constitution sought to promote unity ​of Nigeria​ by increased​ participation of indigenous Nigerians in both the Legislative Council and the House of Assembly. The constitution, therefore, made provision for the creation of regional House of Assemblies, where native authorities were to nominate members of the Legislative Council. To qualify for election, a candidate must have a minimum annual income of fifty (50) pounds. It is important to note that this constitution was enacted after the Second World War. Returning soldiers conscripted to fight on the side of colonial Britain became much more aware of freedom, sovereignty and the right for self-determination as captured in the United Nations charter. So, the 1946 constitution, with increased indigenous participation, is more of a compromise from the Colonial Britain, and is not unconnected with the events of the World War II. Although the 1946 Constitution led to increased indigenous participation in the electoral / administrative process, the constitution itself was chiefly ​crafted by the colonial Britain, and it wasn't long ​before agitations for indigenous input into the constitution started gaining traction. This resulted to the 1951 constitution, also known as The Macpherson Constitution, which is acclaimed to have the highest indigenous input towards the constitution-making process, in the history of Nigeria. The consultations leading to the 1951 constitution comprised of five (5) tiered levels: the Village level, District level, Divisional level, Provincial level, and Regional level. The regional conferences took place at Enugu, Ibadan and Kaduna, which earned the constitution as a widely consulted and local participatory constitution in Nigeria. The major highlight of the 1951 constitution was the formation of a unified Federal System of Government, for the first time, while retaining regional autonomy of the three Geo-political regions of Nigeria. Provision for the Federal House of Representatives was, therefore, ​made for in the constitution, with one hundred and thirty six (136) elected members comprising of: sixty eight (68) members from the North, thirty four (34) members from the West, thirty four (34) members from the East, and six (6) "ex-officio" members. Nigeria's quest for full independence and institutional loopholes present in the 1951 constitution to address and manage tensions and ethnic violence necessitated yet another constitution. In the wake of violent eruptions in Kano, in which Northerners were pitched against Southerners, leading to massive loss of lives and properties, the then British Secretary of States for the colonies, Oliver Lyttleton ​convened a conference in London, with major political parties in Nigeria present. The outcome of that conference was the 1954 Constitution, also known as the Lyttleton Constitution. The new constitution abolished the West African court of Appeal, and established the Nigerian Supreme Court, along with ​a number of regional high courts. The constitution also made provision for the regions to govern themselves, ​granting the regional governments ​legislative powers independent of the central government​. Lagos was isolated from the control of any regional government, and made the Federal Capital Territory, with Ministers given specific portfolios. Southern Cameroon, which until this point was part of the larger Nigeria, was also granted autonomy. Consequently in 1957, the Western and Eastern regions stated their self-governance, while the North indicated their non-readiness at the time. Two years later, the North also stated their self-governance, setting the stage for the quest for accomplishing total independence of Nigeria. The 1954 Constitution is in essence the most effective transition instrument that facilitated end of British colonial rule in Nigeria and fostered the ​actualization of total Nigeria's independence. Nigeria got her political independence as a sovereign state in October 1, 1960 under the 1960 constitution, also known as the Independence Constitution. A British order in Council promulgated the Constitution such that it would take effect as soon as the 1960 October Independence took effect. It would become the very first constitution of Nigeria as an independent sovereign country. The constitution made provision for a Parliamentary system of Government, recognizing three (3) regions: (Northern Region, Western Region and Eastern Region), a two-tier legislative ​framework at the Federal level (the Senate and the House of Representatives), as well as a two-tier legislative framework at the regional level (the House of Assembly and the House of Chiefs). The Prime Minister was to be the Head of the Federal Executive Council, and will be elected by the Federal Parliament. The constitution defined the "Nigerian Citizenship", and outlined constitutionally protected rights of a Nigerian Citizen and person(s) living in Nigeria, ​with set provisions for acquiring Nigerian citizenship. ​ It also made provision for constitution amendment, ​while allowing nominations as a basis for appointing courts judges. 1: It recognized the British Monarch as the Head of State with powers to appoint ​a Governor-General resident agent, who can exercise executive powers on behalf of the Monarch, the Queen of England (Queen Elizabeth II). 2: The constitution also recognized the Privy Council, under Colonial British control, as the highest court of Appeal in Nigeria. These would be seen as significant shortcomings of the 1960 constitution, if Nigeria was to be truly considered as independent, and resolving them would lead to yet another constitution. ​Based on the constitutional conference held in Lagos, between ​25th and 26th of July in Lagos, a new constitution was enacted in October 1 1963 with the major focus being on making Nigeria totally independent from colonial Britain. This constitution abolished the British Monarch, Queen Elizabeth II, as the Nigerian Head of state, and instead made provision for a ​President, with a five-year term in office, who would be elected directly by the members of Nigeria's Federal legislature (the National Assembly and the House of Reps) via a secret ballot poll. The ​President, just like the ​defunct British Head of State, would be mostly ceremonial​. Similarly, the constitution also replaced erstwhile Privy Council was with the Federal Supreme Court, and designated as the highest ​court of appeal ​over any person(s) or matter(s) of conflict in Nigeria. These steps ​resulted to the first true independence of Nigeria, making Nigeria a Republic, with Dr. Nnamdi Azikiwe ​elected as the first President and Commander of the Armed Forces of the Federal Republic of Nigeria. Also notable in the 1963 constitution is the increase of Senate membership from fourty four (44) to fifty six (56) members. Similarly, the House of Representatives was also increased to three hundred and twelve (312) members from three hundred and five (305). These increases were the direct result of the creation of Mid-Western State. The Constitution also abolished the judicial commission ​formerly charged with nominating Judges and vested the power to appoint judges on the Prime Minister. In 1966, a A violent military coup d'etat ushered in military dictatorship for the fist time in Nigeria, and the 1963 constitution was therefore abolished. The erstwhile constitution became replaced ​with military decrees. One of the most notable changes ​by the military dictatorship was the ​change to a unitary system of government, abolishing the erstwhile Parliamentary system, with the three (3) regional governments fused into a centralized unitary government of the military dictatorship. This marked the end of Nigeria's first republic, and consequently, the 1963 constitution. The 1966 military coup cost the lives of prominent Nigerians, including Sir Abubakar Tafawa Balewa (the First Nigerian Prime Minister), Sir Ahmadu Bello (Premiere of the former Northern Region), Chief Ladoke Akintola (Premiere of the former Mid-Western Region), among other prominent casualties. The coup produced General Aguiyi Ironsi, as the first Nigerian military Head of State. Another violent military counter coup, same year, toppled the Aguiyi Ironsi military and produced General Gowon as the Head of State. ​The period between 1966 to 1979 marked a series of military dictatorships and considered, by many, as the dark ages of Nigeria's history. This ​thirteen (13) years of military dictatorship would witness four different Military Heads of State, including a civil war between period between 1966 - 1970, and ​ending in 1976 when the General Obasanjo military administration handed over power to a civilian government of the second Republic, hence, necessitating promulgation of yet another constitution. The 1979 constitution was initiated by the then Head of State, General Olusegun Obasanjo, who constituted a forty nine (49) member constitution drafting committee headed by F. R. A. Williams. It was amended by Justice Udo Udoma, and was used as the instrument to usher in the second Republic ​on October 1st 1979. The 1979 constitution, however, did not revert to the erstwhile Parliamentary system that was in use prior to the military coups, but adopted a Presidential system of Government. This constitution made the President the Head of state and Head of Government, as well as the Commander in Chief of the Armed Forces. The constitution provided for the electorates to choose the President, via an election, and also increased membership of the Senate and House of Representatives to ninety five (95) and four hundred and fifty (450) respectively. ​Alhaji Shehu Shagari and Alex Ekwueme ​became the President and Vice President, respectively, of the Federal Republic of Nigeria during the second Republic. Another military coup in 1983, by General Muhammadu Buhari and Tunde Idiagbon, toppled the democratically elected civilian administration of the second Republic, and once again, ushered in another military dictatorship. In 1985, General Buhari's regime was toppled by General Ibrahim Babangida, who continued another military dictatorship from 1985 to ​1993 ​until he was compelled to step aside due to ​violent civil uprising ​caused by the annulment of the June 12 presidential election in which M. K. O. Abiola was acclaimed to have won. General Babangida's exit was succeeded by ​Chief Ernest Shonekon's short-lived interim-civilian regime of 1993, ​but was eventually ​truncated by General Sanni Abacha's palace coup, bringing back yet another military ​dictatorship which lasted till 1998 ​upon the sudden death of General Sanni Abacha. ​Following the death of General Sanni Abacha, his military dictatorship was succeeded by General Abdulsalam Abubakar's military administration with a promise to return to a civilian administration, ​which he fulfilled and eventually ​ushered in the 3rd Republic on the 27th of May 1999. Former military head of state, General Obasanjo and Alhaji Atiku Abubakar became the President and Vice President of the Federal Republic of Nigeria, in the third (3rd) Republic, via a democratic election. ​The 1999 constitution, which was based on the 1979 constitution became the legal instrument ​that was used to usher in the democratically elected civilian administration of the third (3rd) republic. It is still in use to this day, but have undergone two proposed amendments ​that was signed into Law in 2011 by the Goodluck Jonathan administration. That has been the journey so far of Nigeria's constitution development, from the colonial era to the current 1999 edition, as amended. 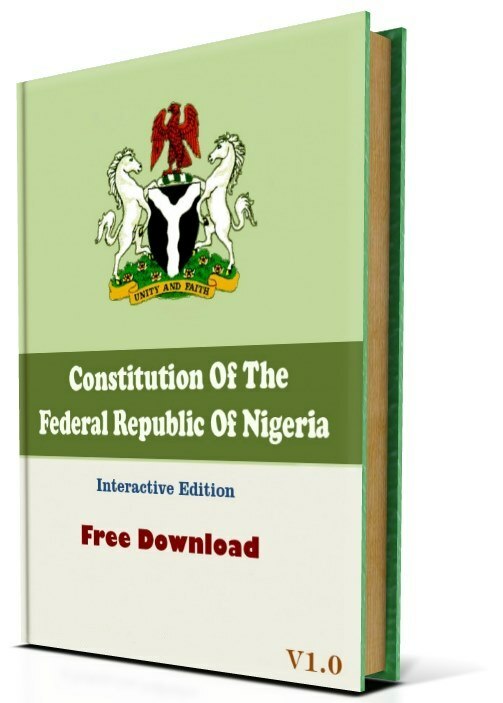 ​​​Get a fully-hyperlinked free pdf soft-copy of the 1999 Nigerian Constitution, as amended. Click the link below to visit the download page.